"This is what I make for Christmas every year, the taste is perfect!" With a small sharp knife, make cuts in the meaty side of the beef roast, and insert slivers of garlic into the cuts. Lay the roast in a roasting pan with the rib side down. Mash the 3 cloves of minced garlic, horseradish, thyme, rosemary, kosher salt, black pepper, and olive oil in a bowl to make a paste. Rub the paste all over the roast, including the rib bones. Scatter the carrots, celery, and onion into the roasting pan around the meat. Roast the meat in the preheated oven until browned and a quick-read meat thermometer inserted into the thickest part of the roast reads 135 degrees F (57 degrees C), for medium-rare meat, about 2 hours and 20 minutes. Remove the roast to a carving board, and allow to rest for 10 minutes. The temperature of the roast should rise to 145 degrees F (65 degrees C). Pour the pan drippings into a bowl, and skim excess fat. 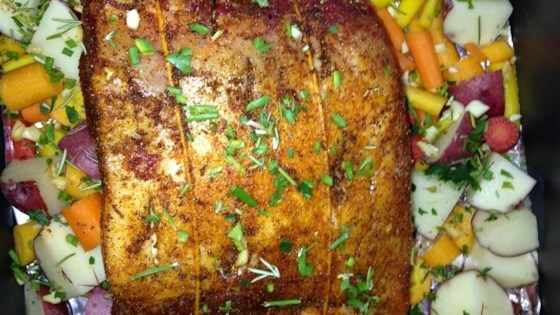 To serve, carve the roast into 1-inch thick slices, arrange slices on a platter, and place vegetables around the meat. Pour the pan juices over the meat and vegetables. Absolutely wonderful, especially WITH the horseradish and not Dijon mustard. Didn't change a thing and it was perfect, thank you.